Description: A pair of ex BN GP-50's sandwitching a Heritage 1 near depot. Nikon FG, 85mm lens, Kodak E100VS. Description: Still in Big Nothing paint at South Jct. 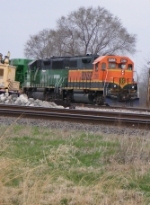 Description: The BNSF Barstow Local at the Iowa Interstate Yard in Rock Island. Description: Different view of the Barstow Local. Description: The East Local has an awesome looking ex. BN unit leading today. Description: The Barstow Local coming back from interchanging with the BNSF Clinton Local in Bettendorf. This was the longest BNSF Barstow Local I've ever seen with over 50 cars. Description: The east local enters Prairie with a classic ex. BN EMD and a warbonnet Dash 8. Description: L CHI107 four motors and 79 cars!